I have always been more of a practical gardener than an idealist. Although it is nice to have an array of pretty bedding flowers I am not inclined to invest the time or space for such luxuries: for me each plant has to earn its place in the garden and be productive in some way. This doesn’t mean that my vegetable plot is devoid of flowers however. Flowers play an important role in any organic garden but the criteria for selecting them are different to ornamental gardens – it’s not the size or color of the flowers that count but their attractiveness to the right kind of insects. Insects that eat pests: Hoverflies, lacewings, ladybugs and others are all the very best protection a garden can have against the invasive pests that feed on crops such as aphids, mites, thrips, mealybugs and scale insects. Insects that aid pollination: Bees are the primary pollinators (both honeybees and bumblebees) and need as many good sources of nectar as possible given the current sharp decline in numbers. However, many other insects can help pollinate crops including wasps, moths, butterflies and certain species of beetle. 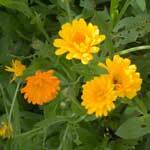 Calendula: Known as 'pot marigolds' but actually unrelated to the more common marigold family of plants (Tagetes), calendula is easy to grow and keeps flowering through the summer if you regularly pick off the seed heads. You can easily save the large curled seeds as they are easy to handle as well as drying and storing well. Marigold: The bright yellow blooms of the many kinds of marigold are good at attracting hoverflies, bees and butterflies and the strong scent of the French Marigold types is said to deter nematodes. Like Calendula they will grow in almost any kind of soil, are easy to save seed from and often confuse pests if inter-planted with vegetables. 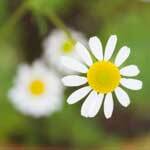 Chamomile and Daisy: Most composite flowers from the daisy family will attract a range of beneficial insects. The flowers may not appear to be stunning but hoverflies and predatory wasps love them. An added benefit of growing chamomile is that you can make delicious fresh herbal tea from the flowers. 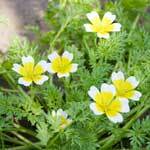 Poached Egg Plant (Limnanthes douglasii): One of my favorite flowers for growing along the edges of raised beds. Not only is it great at attracting hoverflies and bees but it also produces lush green stems that can easily be dug into the soil when flowering is over. Onion and Garlic: It's not uncommon to have some onions or garlic bolt (shoot up flower heads) or produce much smaller bulbs than expected. Rather than pulling them straight up I like to leave these ones in the ground and let the flowers fully develop. Hoverflies love them and they look quite unusual and attractive too. Parsley, carrots etc. (the umbelliferae plant family): Again, leaving excess plants from this family to 'flower' attracts many beneficial insects such as hoverflies. Although not very colorful I do like the patterns of the flower heads. Comfrey: Bees love comfrey and it also provides the perfect source of nutrient-rich mulch for your crops. 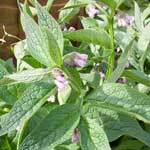 However, it is highly invasive, so make sure you check out our comfrey article first. Nasturtium: These do the opposite of attracting beneficial insects – they are highly effective at attracting blackfly away from your main crops – see my article on Trap Cropping for details. They lose their beauty once covered in blackfly but it is easy to remove the affected stems and dispose of them away from the vegetable plot. 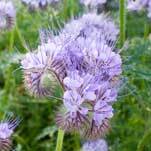 Phacelia: I love this plant and can never bear to dig it into the ground. Because it over-winters well it provides the perfect nectar source for bees as they emerge from hibernation and its lavender-colored flowers are quite distinctive. It can be left right through spring until the early summer crops need the space. 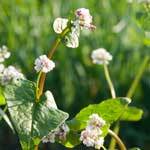 Buckwheat: Equally good at attracting beneficial insects, this takes up less space than phacelia but consequently needs to be sown more thickly if using it as a green manure. 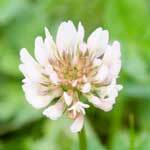 Clover: Bees just love clover and honey bees use it to produce a delicious clover honey. Red or crimson clover is a fantastic source of nitrogen for the soil too, widely used in organic farming. "Hi Jeremy. Thanks for all the great information. We have friends that live in England. I will tell them about thus website. I love nasturtiums, the bright colors and pepper taste are amazing. Is that what the good bugs like? Also, I'm glad to know that merigolds are the right thing to plant around the vegetables even though I was just trying to keep the pesky rabbits out." "I grow borage to mix into salads and it attracts bees, moths and various other nice buzzy things. 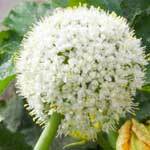 It's great for pollinating, looks good, is cheap (self sows easily) and is edible. I also grow rows of lavender and thyme, for scent, cooking and for bees / pollination. They work beautifully as low hedges to separate garden areas. Sage is also useful as a herb and to attracts bees. Pests also don't seem to like the strong smell of herbs much. One year I was given some cerinthe major purpurascens seed too. I have saved seed every year as bumble bees just adore it and it fits in between most plants. It's not edible but it's a star attraction for the bees in my garden." "Kim - low growing herbs are great for attracting ground beetles (another beneficial insect) and helping ladybirds to overwinter as well as the reasons you give, so that's a very good suggestion, thanks." "I am interested in adding a green roof to my allotment shed to provide an extra habitat for beneficial bugs - sedums are the usual type used for this purpose, but I wonder about using low growing herbs too, so I can crop the roof as well as the biodiversity aspect. Does anyone have any experience of this?" "Trish - I don't have any experience of using herbs on a roof but there are some details here that make me think it is possible: http://www.livingroofs.org/green-roof-herbs.html"
"Kim, I'm not sure you should eat the borage. I grow it too and the bees love it and it has other companion benefits. However, I heard it can damage your kidneys if you eat the leaves. As far I can see the flowers are okay and particularly good in gin! It's exciting to grow. Going to read the website on growing on roofs now- what a good idea. Happy growing all"
"Thank you for the useful information on this site re: companion plants for my home vegetable garden. Trying to avoid insecticides - much healthier for the plants and me. Happy garening everyone :-)." "How do you plant companion plants...literally in between the veggies, or around them? I've seen marigolds sandwiched between crops...I would have thought you did it the other way round, 2 rows of marigolds and your veggies in the middle? Don't the plants compete with the veggies? You can see I'm a beginner lol Thanks"
"Yes, the flowers can compete with the vegetables if planted too close - they do need room to grow! 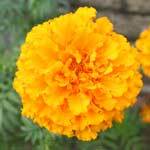 Marigolds are best around the edge when using their strong scent that deters pests. For other companion plants it doesn't matter because they're there to attract beneficial insects which eat the pests so they can go anywhere near the plants you're protecting." "Hi Jeremy, thanks so much for posting this. I am new to growveg and to vegetable gardens (I grew a few veggies in cont,ainers last year at our old house). Now that I have a deep south-facing lot I am extremely excited to start a 'proper' vegetable garden. I am clicking all the tangent links in your articles and trying to take in as much information as possible - thank you so much for your advice!" "Please don't forget Alyssum. It is very helpful with the control of aphids! Plant plenty around your brussel sprouts." "Fran, we're going to be adding Alyssum and many other beneficial flowers to our Garden Planner in a few weeks' time, so thanks for mentioning it." "Hi Jeremy/Bob/Barbara. Whilst surfing the net on gardening matters, I came across your site. Brilliant!! I have now listed it as a 'favourite'. On the question of companion planting, I would suggest also including Achillea (Yarrow), which I have found to be very beneficial. What do you think??" "Glad you are enjoying the site Roger! Yarrow can also be used but our horticultural expert Barbara says it often spreads too much and is therefore hesitant to recommend it for vegetable gardens because it can be a bit invasive. Have you found that?" "I know a few friends i try to tell them to put flowers around there vegetable garden. bad bugs got it. I wrote down your list. I planted asparagus near a walnut tree will it be alright Thank You Richard"
"Hi Barbara/Bob/Jeremy. This is a wonderful explanation on pollination by insects in a garden. Veggie gardening has become more interesting. You can also have a look at the variety of Veggie flowers that you can grow and enhance the beauty of your garden.Read more at http://mybestdigg.blogspot.com/2011/08/wanna-see-beauty-of-veggie-flowers.html"
"hey working on a project for school and wandering what flower can you eat but put in your garden to help like the others. 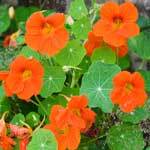 im willling to try new things "
"Nasturtiums have edible flowers and leaves and can be used in salads." "Hi Jeremy, Thanks for the great read! I am a teacher with a small school garden and am struggling with how to transition to fall veggies while also being proactive in keeping the garden as a whole healthy. This past spring and summer was my first ever gardening experience, and I did it with my class and later summer camp. What an adventure! Could you clarify something for me? When you refer to 'cover crops,' does that mean they survive the winter and then before spring planting we should till them in? Or are all perennials, dying in cool/cold weather then returning in spring? Thanks and feel free to check out my blog about teaching and gardening. :) http://digginteachingardening.blogspot.com/"
"Hello, I enjoy browsing this site and have been growing beneficial/sacrificial plants in my veg patch for over 20 years - passed onto me by my, now 78 yr old, father. I use station/block plantings of Marigold, Calendula, Geranium, Nasturtium and Chives through the patch and place potted (big pots! )lavendar and rosemary strategically around the garden. The combination of strong fragrences and beneficial properties seem to confuse and repel all but the most persistent of plagues. Rarely do we ever have anything like serious infestations - though the slugs and blackfly are pesky little beggars so off to the chickens they go!!" "Hi winter is cold here but i want to plant flowers, pre christmas blooms. which flowers would you recommend? Caroline "
"Caroline, there aren't any flowers you can plant this late in the season and have them bloom before Christmas if your winters are cold, sorry. Most flowering plants don't like the shortening day length and cooler day temperatures as we approach winter." "I use a guide dog and presently I have both an active and a retired guide. They eat my vegetables. I'm wondering whether planting flowers with strong fragrances might deter the eating? Anyone having any ideas for keeping dogs out of my vegetables, with the exception of a fence, please let me know. Thanks!" "Just found this website and simply adore it! I've been gardening for years, though I do have books that help, I'm not a dedicated planner so I forget which plant should follow another so my style is inevitably haphazard. This site is SUCH a relief for someone who loves the action of gardening but struggles with the details that makes it a true success. THANK YOU for creating this, especially appreciate info about Potager styles. For Connie and her dog, Ha, I have a lab who loves veggies, raids the berries and even jumps on the fruit trees to knock down the fruit too. I'm thinking a boundary of roses might keep her out. I always wanted a rose garden and hopefully they attract beneficial insects too." "Love the website. I will be growing veg for the first time this year and your tips on companion planting will be a great help." "I've just joined this brilliant site, and find it very helpful. I'm totally new to growing fruit and vegetables, but know quite a bit about shrubs and flowers. I want to plant a small bee-friendly garden in the middle of the vegetable area, and recall planting some annual Candytuft each side of the path at a previous address. The area was a cloud of bees, going crazy for the nectar - I've never seen anything like it! So it's going to be one of the main plants for the area, surrounded by a small lavender hedge. A swing seat and a cool drink completes the picture. (It's a poor heart that can't rejoice inbetween all that work). Happy gardening to everyone. " "Hi, I just found your website and I am loving it! This year we are planning our first garden and we want to involve our kids (ages 1, 4, and 6). We have connected two 4x4 raised beds to make a 4x8 growing space. I am interested in planting our seedlings in square foot grids, but where would we place the marigolds? Can you place them at the intersections, or should we plant fewer veggies in the grid than recommended so that we can make room for the marigolds? My mother always planted marigolds at the edge of her typical row garden, but I am concerned the children will destroy the plants reaching over them to get to the veggies. Finally, how many marigolds would you recommend for the 4x8 area? Thanks for any advice you are willing to share!" "thanks a lot for your help." "i have just got my first allotment today and am very excited!! its set in an old victorian walled garden and is clear apart from a row of rasberries..am loving this site already as i havnt a clue how to get started!" "excellent garden i like it. " " thank you I have just taken over an allotment, your good advise is very informative. " "he blog and data in this, is very good and informative also." "I have explain so many article of this site in which some of them were very interesting and inspiring.This article has good title with good description." 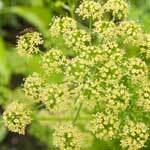 "I have never thought of adding flowers to my vegetable garden to help increase its yield. My garden has definitely struggled in the past years and I wonder if this could be the solution to my problems. I will be sure to plant some flowers with high protein pollen next year. Thank you for sharing."